You feel it immediately, standing before its grand entrance, a massive, ornate archway and oversized, wooden double doors. 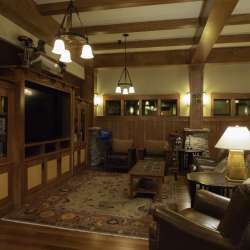 This place is truly something special, and, indeed, Tamarack Lodge is that, and more. If Tamarack Lodge’s exterior seems impressive, by all means, step inside. Here you’re immediately welcomed into an environment that feels both familiar and unique. The gracious reception area, highlighted by great pillars and stone woodwork, reflects an Arts and Crafts architectural style. The roaring fireplace and decorative accents—classic boat engines and stuffed game birds, to name a few—create a definitive “Up North” feel. 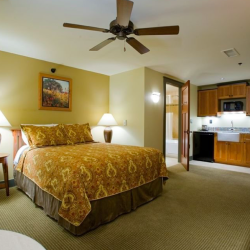 The units at Tamarack Lodge are no less than impressive. Guests have the choice of one-, two- and three bedroom, fully furnished condominium residences. Most have open-floor plans with over 1,500 square feet of space. The minute you enter, you’re greeted by an amazing bay view off the private balcony. Each residence features the luxuriant amenities you’d expect: top-of-the line appliances, granite countertops, solid maple and cherry cabinetry, a gas fireplace, and, for the lucky few, occasional sightings of the resident bald eagles. 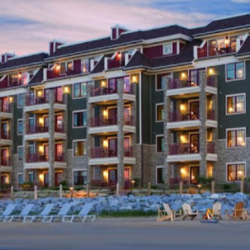 Tamarack Lodge has 800’ of beach frontage, with plenty of Adirondack chairs for bayside lounging. There are a number of gas grills for beachside barbecues. The extended dock provides the perfect platform for watching the fiery sunsets. Once the sun disappears, the staff builds a fire in the large fire pit and provides each guest their own s’mores kit. Tamarack Lodge is an “up north” experience taken to a whole new level, the memories stay with you long after you leave.